Powerhouse Hollywood comedy writer, Dana Fox, is sick and tired of hearing the word “rom-com” when it comes to describing her movies. She’s written What Happens in Vegas, Couples Retreat, The Wedding Date and the TV show Ben and Kate. ScreenwritingU Magazine sits down with the writer/producer to hear about her new film How to Be Single, a comedy about finding yourself in New York City starring Dakota Johnson, Rebel Wilson and Leslie Mann. ScreenwritingU Magazine: As a female writer in Hollywood, why is it important to write and produce? Dana Fox: I think what started that for me was doing Ben and Kate, which is my TV show. And I think writers are the lowest person on totem pole in the movies in general… unless they’re writer/directors like Judd Apatow. So, I went off and did this TV experience and as a writer in TV, all of a sudden you’re treated like the boss, and everyone was turning to me for what color do you want the wall to be…? And I said, I have known what color I want the wall to be since the beginning, and no one ever asked me. And yes, I know what color the wall should be and yes, I thought about it and yes, it has to do with their socioeconomic background. So, I felt like oh my god, I’m a fish who finally found my water… And I was so happy. Once you get to the place where you stop asking for permission, you’re like here I go. And I didn’t need permission from anyone anymore. I know what I’m f*&^ing talking about and I’m good at this. And I don’t need to pretend I don’t know the answer because I’m a girl and I need to make guys feel more comfortable. ScreenwritingU Magazine: Do you think women self sabotage when it comes to being assertive? ScreenwritingU Magazine: Rumor on the street is that you hate the word rom-com. Explain…? Dana Fox: Rom-com is sexist. I don’t get think it gets applied to movies that are exactly like this that don’t star women. Knocked Up? Nobody called that a rom-com. They called it a comedy, because it was a man having the exact same conversations about relationships and the exact same things that the women in this movie are doing but Judd Apatow wrote it and there’s a f^&%ing guy staring in it. So, look at this amazing balls-to-the-wall comedy. And it’s like any movie I’ve seen that has a guy behind it, he’s either the writer or the director, or has a male cast in it who are doing exactly this stuff, they always call it a comedy. And then they go “chick lit” or “rom-com” to this movie. Books that are written by women or have female characters immediately get called “chick lit.” I find it sexist. I don’t think it’s true. I think this movie is more of a comedy. When you see it, you’re surprised with how much heart it has and surprised with how much emotion it has. But it’s like a Bridesmaids. That movie had a relationship in it, and nobody called that a rom-com. It was because a guy made it. And I love those guys and I worship them. I think they’re amazing. But I see it happening all the time. ScreenwritingU Magazine: How do you structure an ensemble film like How to be Single? Dana Fox: This was one of the biggest structural challenges I’ve ever had. I think the role of Alice — the Dakota Johnson role — I realized that she is the audience in the movie. It’s her emotional journey that the story has to be keyed to. But the big revelation for me, was that it was a love story between her and Rebel Wilson. All the plot moves that you normally have to have are between her and Rebel Wilson’s character. ScreenwritingU Magazine: Is it true you used a classic action movie as inspiration for the structure? Dana Fox: The inspiration behind it was The Fugitive. Most people would say that the protagonist of that movie is Harrison Ford. And the antagonist is Tommy Lee Jones. But actually, it’s the reverse. I think of the protagonist as the person who changes. And the antagonist is the person who affects change and makes waves in their life. So, at the beginning of the movie Harrison Ford says, “I’m innocent, I didn’t kill my wife.” And at the end, he’s like, “Dudes, I said I was innocent. I didn’t kill my wife.” And for the whole movie he’s saying the same thing. And at the end of the movie he hasn’t changed, just people believe him. Tommy Lee Jones starts off the movie saying, “I don’t believe you. I think you’re a liar. I think you’re a murderer.” And then he starts to think, “Wait a minute, I might believe you…” In the beginning, he says, “I don’t care.” And then he gets to the point where he does care. So, he’s the character that changes. He’s the audience. And so that was a big revelation for me for this one. You have to follow Alice’s journey. Alice is the one who’s changing. And Rebel is causing her to change. They’re in a love story with each other, and it’s about their relationship. And so, the structure follows that arc. And all the other characters have their own arcs and their own mini-stories. But, the structure that has to work is Alice’s structure. Because she’s the audience. How to Be Single releases into theaters February 12. 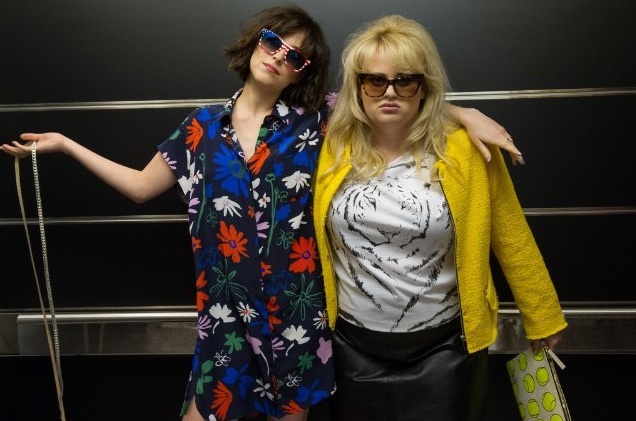 No Replies to "HOW TO BE SINGLE screenwriter Dana Fox explains why rom-com is a dirty word"